Interview Attire 101: Seven Suggestions to Help You Make an Impression…and Hopefully Get an Offer! Deciding what to wear to a job interview can leave you feeling stressed and uncertain. Marla Tomazin shares pointers to help you confidently dress for success. New York,NY(May 2012)—One of the most stressful rites of passage in an adult’s life is the dreaded job interview. There’s so much to worry about: how to make a good impression on your interviewer(s); how to present yourself as the absolute best candidate for the position; and, of course, what the heck you should wear! “The clothes you wear to a job interview are a big deal, because the image you present to your interviewer can sometimes make the difference between getting and not getting a job offer,” confirms http://www.marlatomazin.com/“>Marla Tomazin, who has been a New York City-based image consultant for over 20 years after earlier experience in the fashion industry. Focus on quality, not quantity. Always, always choose interview clothing in the best fabric you can afford, even if it means starting out with only two suits or outfits. (You can build on that base later once you’re receiving your new paycheck!) Quality clothing looks best, holds up longest, travels well, and doesn’t need to be dry cleaned as often. Tomazin recommends investing in wool suits and skirts specifically, since wool is durable and easy to maintain, and can be worn at least 10 months out of the year in most climates. Make sure your clothes match you. In addition to choosing high-quality pieces, it’s also important to make sure that your interview clothes are the right color and shape for your age, coloration, body type, and career. Ask a friend, sales associate, or image consultant for advice if you’re not sure what works best for you. Tomazin specifically warns against pieces that are too short, too tight, or (for more mature applicants) too young. Remember, a flattering, well-tailored outfit shows attention to detail and makes a good first impression about you and how you will do business. Be classy and memorable. Every job applicant wants to stand out from the crowd. But during the interview stage, it’s probably best not to distinguish yourself sartorially. Above all, you don’t want to make a lasting negative impression with wobbly too-high heels or an in-your-face tie. If you don’t want to be forgotten because of your “boring” beige suit, focus on setting yourself apart by how you present yourself, your experience, and your potential. Remember, people are making decisions about you from the moment you first meet, whether you realize it or not. So when in doubt, err on the side of dressing conservatively. You can think about moving closer to the cutting edge of fashion after you’ve been hired. Find a balance between fit and comfort. 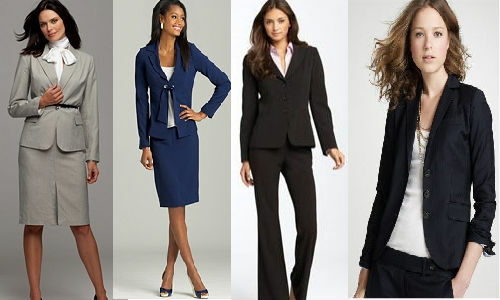 According to Tomazin, another reason to make sure that your interview clothes fit is simple: comfort. Think about it: If your jacket is a little too tight under the arms, for example, you’ll be distracted when it’s most important for you to be on your game. And if your skirt allows for only a narrow range of movement, you’ll be that much more ill at ease. Make sure that your interview clothes are comfortable so that you can focus on the meeting and on letting yourself shine through, not on what you’re wearing. Tap into the power of the column. Column dressing is a sure-fire way to make sure that you dress successfully for your interview, as long as the color is flattering. Whether it’s a dress, a top and a skirt, or a top and pants, you can’t go wrong. Your jacket can be the same color as your column or an accent color. Tomazin promises that you’ll look pulled-together—which will please your interviewer—as well as taller, thinner, more successful, and smarter. What’s not to love? Your shoes should be polished and in great shape. No scuffed or kicked-in toes! Replace or repair them when necessary. Your hair should be groomed and styled conservatively. If possible, schedule a trim a few days before your interview. For ladies specifically: Invest in closed-toed pumps with a moderate heel height, and wear stockings (it’s best to stick with solids). Also, it’s a good idea to manicure your nails. Go with a neutral color that is easy to repair if chipped while traveling. Top it off with a tote. Chances are, you’re not going into your interview empty-handed. At the very least, you’ll probably have copies of your résumé, a notepad and pen, and maybe even a portfolio of some sort. If you’re traveling, you might also be carrying your iPad, laptop, and/or other work files. Clearly, you’re not going to look very professional if you’re hand-carrying all of those things! Tomazin says you should look for a tote—preferably leather—that keeps you organized, looks great, and allows you to have all of your files and accessories at your fingertips. (Just make sure to turn off your phone’s ringer before going into a meeting or interview so you aren’t left digging around in your bag to turn it off!) Remember, a durable, professional bag is an investment, so if at all possible buy one that will serve you well for years. From a successful career in the fashion industry, Marla gained expertise in retail buying, merchandising, sales, and marketing. She began with May Company in Denver after earning a B.S. in Marketing from the University of Denver. Marla moved to New York where she worked with several well-known Seventh Avenue design firms. As she developed her business skills, Marla made a serendipitous discovery—an innate sense of style and facility for working with fabrics and colors to maximum advantage. 2012 Women In Business & Industry Out Today!